We purchased a new construction home in NC August of 2015 and were faced with the daunting task of how to make the basically blank yard look good. Our lot has some unusual features and seemed hard to deal with. We hired Steve Cox to do a detailed landscape plan that we could implement over time and he came up with a great design that solved our problems. This isn't the first time we used him for a design, as we used him in the '70s for two previous homes in Michigan and each time we were more than pleased with the results. This time was no exception... better than ever. Although we have not completed the entire project, we definitely have a great vision of what to do and where to go next. 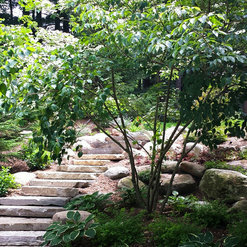 Steve is an extremely knowledgeable landscape designer with the necessary artistic talent to bring your project to life... 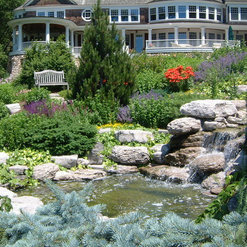 He is talented enough to have been chosen to work on the Meijer gardens in Grand Rapids, MI. Frederik Meijer Gardens & Sculpture Park is a 158-acre botanical garden and outdoor sculpture park located in Grand Rapids Township, Michigan in Kent County. If you are looking for someone to work with who has a passion for landscape and a real vision for design, you can't do better than Steve. Knowledge, work quality and professionalism? Outstanding. Add creative as well. The project was completed within budget with minimum disruption. Very pleased with the value that the landscape project has added to our home. Stephen Cox is a gifted designer with brilliant insight and creativity. 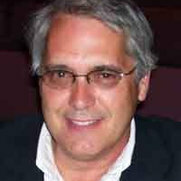 Steve was retained to develop a hillside plan on a new construction site. He patiently walked the site and listened to our concerns and wishes for the property. The plan he developed is well thought out and exceeded our expectations. We are looking forward to completing the entirety of the design and enjoying Steve's vision. We had just moved to Grand Rapids and needed a major lanscape project done before winter. I found Steve Cox in September and he made it happen. 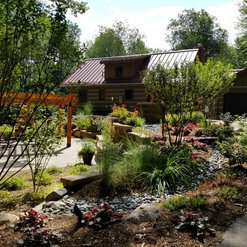 He came to look at the project, included us in all the details, asked which plants and trees I would prefer and made a beautiful rendering of the yard. He also found a landscaper who was very efficient and who had a wonderful crew who worked long days to get the jobe done before snow started to fall. Steve assisted the landscape crew so all the plants, trees and bushes ended up in the right place. When I asked for changes he made them promptly. He did an excellent job choosing plants the deer do not like so I have had minimal damage. I would highly recommend him. 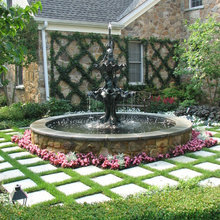 Cox Landscaping had design ideas that were innovative and modern yet captured the traditional, classic look we wanted. 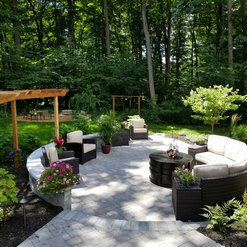 Steve and his team were thorough, they discussed layout and plants thoroughly yet in business-like fashion, and helped see that our project went smoothly. The end result is excellent and we would most definitely recommend this business. 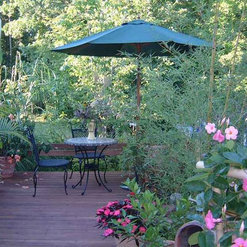 Steve Cox did my landscape design which included a design for an ipe deck. 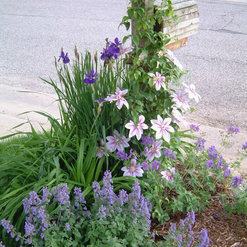 The design plan incorporated everything I wanted, and every planting was pictured. I contracted out the deck construction and hardscape installation, which was done in accordance with Steve's design. I did the planting of all smaller items, some of which I had not heard of before seeing Steve's plan. 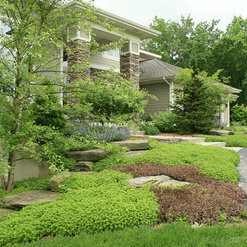 Maybe the best recommendation I can give Steve is that all my neighbors stop to admire the landscaping around my home. I have one small area that still needs improvement, and I will most certainly ask Steve to do the design. Mr. Cox provided us with an on property meeting to discuss our interests and projected thoughts of a long term (whole property) project with steps over the short term, Discussed where new garden beds could be developed and what would be feasible DIY versus hiring a landscape crew. We were able to complete large sections ourselves the summer of 2013. We plan to continue in the growing season of 2014. Our one disappointment was recalling telling him the type of color we preferred in flowers, (not liking pink) and realizing that much of the plan had pink added. He was responsive to emails and phone calls within a short period when questions arose or looking for recommendation for where to find certain plants. 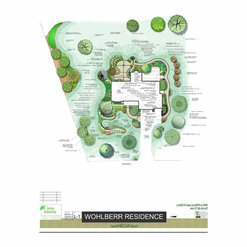 Very friendly, landscape plan was printed large color and small black and white for our use and also given electronically. 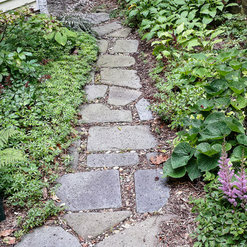 We found his individual service costs to be reasonable when wanting just a plan without a landscaper attached that would utilize plants they already were supplied in. We hired Steve to draw a plan to "remodel" the existing old landscaping at our home. We have a small budget, so to save money, Steve drew our plan using photos and video that we sent him (and we'll be doing the installation ourselves - ugh!) Steve is great to work with - we received an absolutely beautiful plan - and very quickly! Another thing we REALLY appreciate about Steve is that he's always willing to answer any questions and share his extensive knowledge/tips of the trade. We'll be starting installation this spring, and we know that we can count on him to be there if we need guidance. Stephen, Did a wonderful job designing our landscape. He was very thoughtful when it came to our needs. He worked around my families hectic schedule to make our dream come true. I would strongly recommend Stephen for anyone that has a landscape need. Commented: Lighting fixture12 Volt copper light by Vista. I don't believe they make exactly that style anymore. Closest would probably be their light 2137-CSN.